University of Louisville basketball player Kevin Ware has suffered a horrific leg fracture that left the bone in his right leg protruding on live TV during NCAA Tournament game Louisville-Duke on Sunday night. Kevin Ware, 20, jumped high in the air to block a three-point shot when he landed badly on the leg as he crashed to the court. Teammates and Coach Rick Pinoto were in tears as kevin Ware screamed with pain and writhed on the court. An official told several reporters that a bone snapped. Trainers immediately covered the leg with a towel and placed Kevin Ware on a backboard, then lifted him onto a stretcher. Kevin Ware’s teammates responded to the shock of his loss by returning to the court with a vengeance. The second half of the game saw Louisville dominate Duke – clobbering the Blue Devils 85-63. Louisville will play Wichita State in the Final Four next weekend. The winner of that game plays for the NCAA men’s basketball championship. His teammates held up a jersey with Kevin Ware’s name as they celebrated their resounding victory. Silence fell over Lucas Oil Stadium in Indianapolis, Indiana, where the Elite Eight game was being played, as horrified fans waited for news of Kevin Ware’s condition. The injury occurred with 6:33 left in the first half as Duke’s Tyler Thornton made a 3-pointer to get the Blue Devils within 21-20. Kevin Ware tried to contest the shot and his leg buckled when he landed, bending gruesomely. The injury happened in front of the Louisville bench, and the Cardinals were overcome with emotion. Russ Smith collapsed onto the floor, along with several players, and was clearly crying as doctors attended to Kevin Ware. As Kevin Ware was being loaded onto a stretcher, the Cardinals gathered at midcourt until coach Rick Pitino called them over, saying that Ware wanted to talk to them before he left. 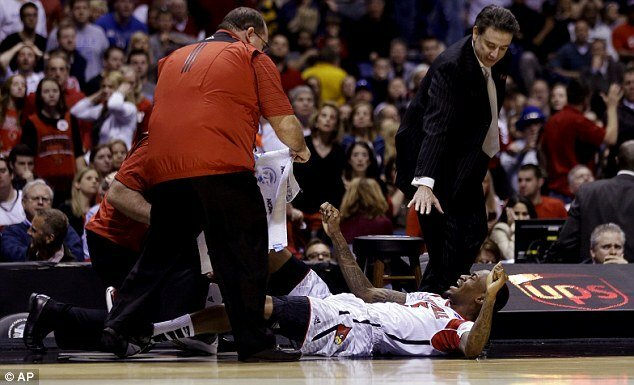 Rick Pitino wiped away his eyes as Kevin Ware was wheeled out, as did several of the Louisville players. Kevin Ware, a native of the Bronx, New York, is a sophomore guard who has become a force on the number-one-ranked Cardinals team during the NCAA Tournament. ESPN.com reports he could undergo surgery tonight at Methodist Hospital in Indianapolis. Team officials say Kevin Ware’s pain is “under control”.